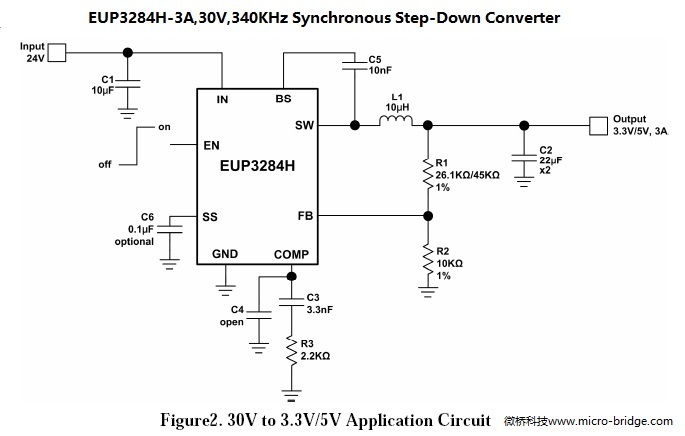 The EUP3284H is a synchronous current mode buck regulator capable of driving 3A continuous load current with excellent line and load regulation. The EUP3284H can operate with an input range 4.5V to 30V and the output can be externally set from 0.92V to 20V with a resistor divider. Fault condition protection includes cycle-by-cycle current limiting and thermal shutdown. In shutdown mode the regulator draws 3μA of supply current. Programmable soft-start minimizes the inrush supply current and the output overshoot at initial startup. Automatic pulse skipping mode operation increase efficiency at light loads. The EUP3284H require a minimum number of external components.